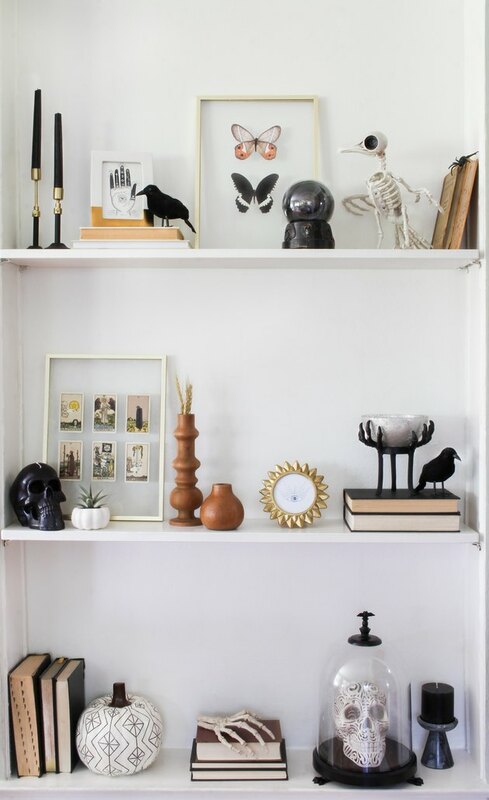 Step into our web of scary-chic style, where we're channeling mystical vibes to transform our everyday shelves into a spellbindingly spooky shelfie. Inspired by the bohemian qualities of the vintage fortune teller aesthetic, we raided the Hyde and Eek! Boutique collection at Target to trick out our shelves with otherworldly items that also happen to be eerily affordable. Since we love holiday decor that you don't have to put away, we even mixed in some pieces that you can use year round. 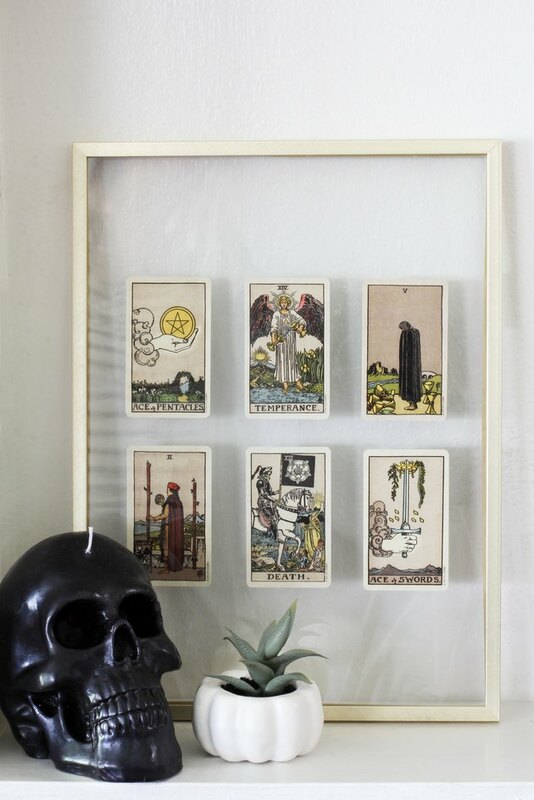 Once we settled on a fortune teller theme, this informed our selection of decor items ranging from a crystal ball and tarot cards to palm-reading and third eye prints. We wanted to craft a cabinet of curiosities kind of vibe, so naturally we had to throw a few creepy spiders and skulls into the mix. 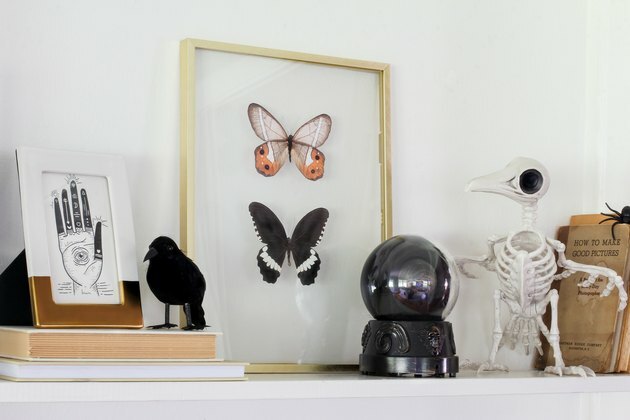 For easier styling, be sure to select a variety of items like art prints, books, and candles, in addition to the various Halloween-themed objet d'art you'll find at Target. 2. Streamline your color palette. Keep your color palette tight by limiting it to two or three dominant colors. We went with black, white, and gold for a sleek but scary look. By turning the book spines to the back of the shelf, we were able to incorporate books into our shelfie without distracting from the overall color palette. 3. 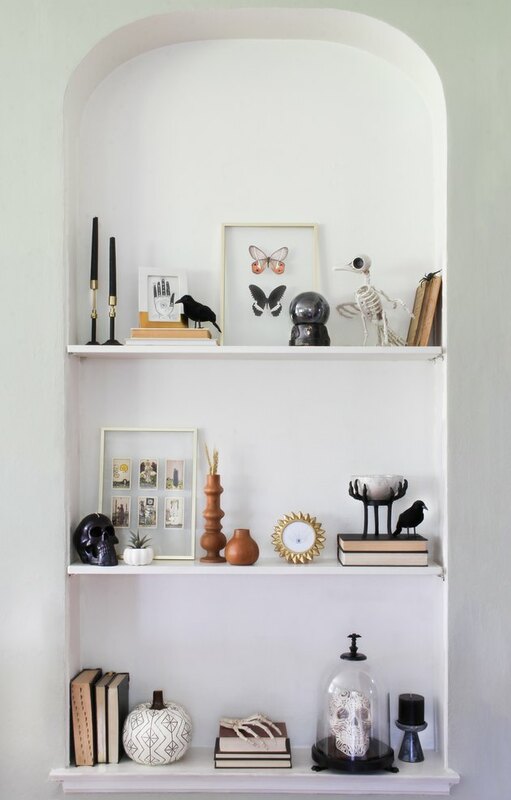 Mix spooky and chic items. 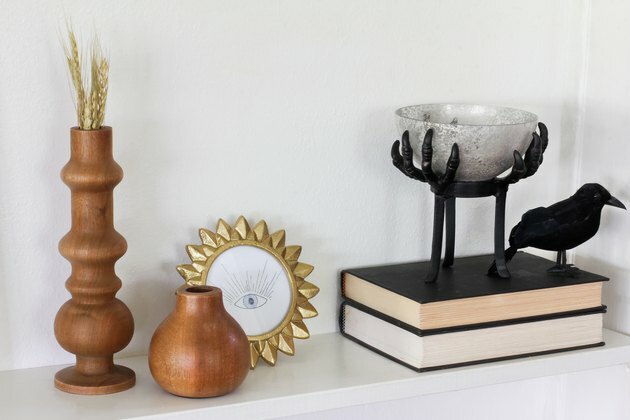 It's tempting to go overboard with all the wickedly fun Halloween ephemera, but the key to achieving the spooky-chic look is by tempering all the scary stuff with some regular decor pieces. 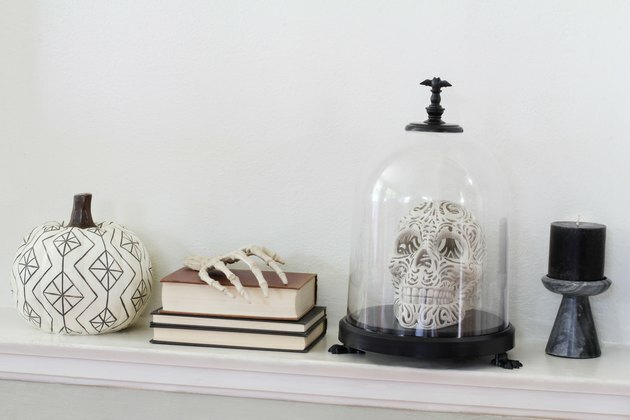 For example, a marble pillar candle holder takes on a ghostly quality when paired with a skull and cloche. A plain stack of books assumes creepy crypt vibes when a skeleton hand is placed on top. 4. Layer big and small pieces. 5. Follow the Rule of Three. Items tend to be more visually appealing when they are grouped together in odd numbers (generally, in groups of three, five, or seven). 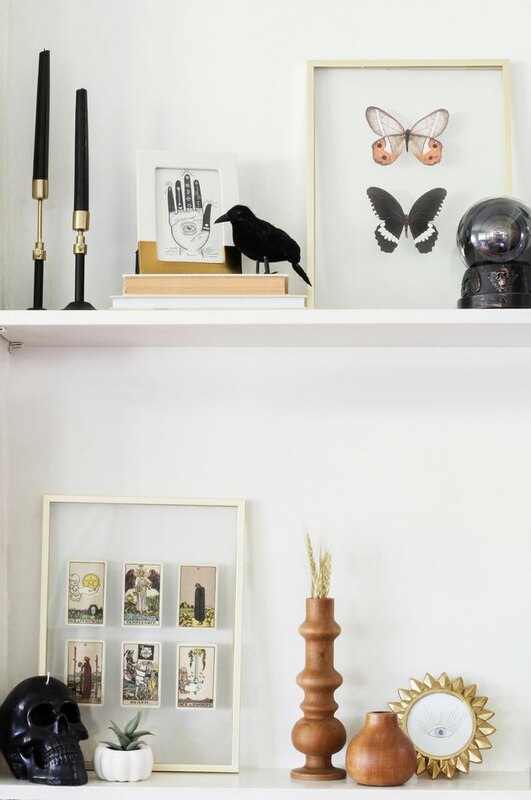 Stick to the rule of three when placing items on your shelves, and you can't go wrong. 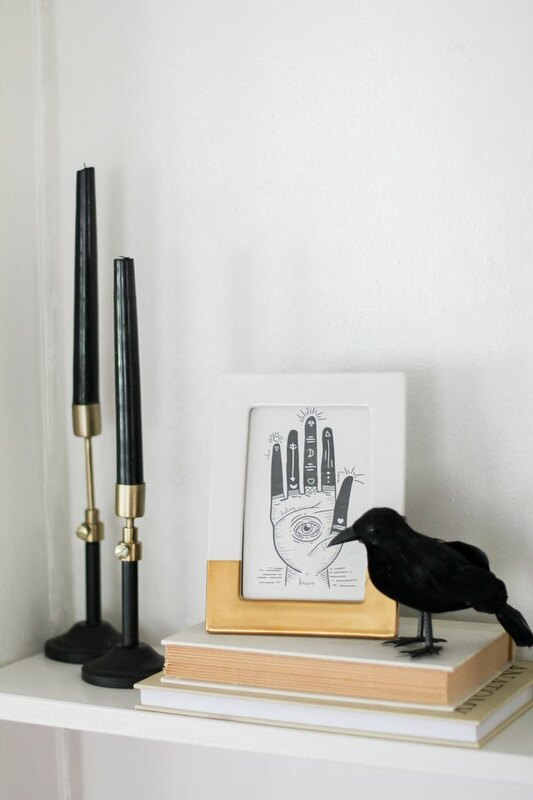 Here we've created two separate trios: 1) tall wood vase + short wood vase + gold frame; and 2) crow + spooky bowl + books. You know that famous quote by Coco Chanel that goes, "Before you leave the house, look in the mirror and take one thing off"? The less-is-more approach applies to spooky shelves, too. Beware of over-styling your shelfie. Too many items = clutter. Leave some breathing room around your pieces for a more curated look. And that's all there is to creating a spooky shelfie that'll have all the ghouls and goblins liking it on the 'gram. Be sure to tag us @hunkerhome if you post your own spooky #shelfie! 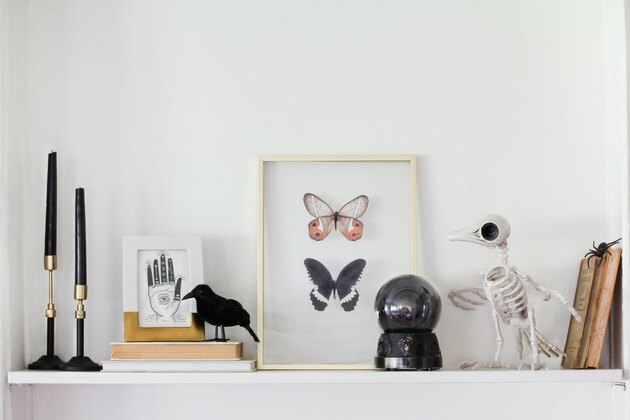 Pssst ... in case you're wondering how to transition some of these pieces to regular decor after Halloween, be sure to check out our article on fall decorating tips, also using Target items.